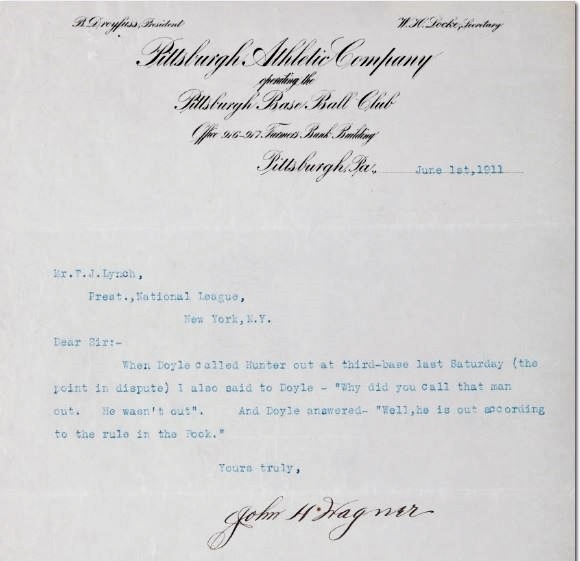 The Case Of The Missing Honus Wagner: How Did A Hall Of Fame Letter Protesting An Ump’s Call In 1911 Slide Into A Heritage Auction? A letter signed by Honus Wagner is a key piece of evidence documenting thefts from the Baseball Hall of Fame in Cooperstown. It’s no secret that national treasures have been smuggled out of the archives of the Baseball Hall of Fame in the sleepy little Village of Cooperstown, New York. In 2001, national news outlets reported that the FBI recovered four baseballs signed by US Presidents that had been stolen from a museum display case back in 1972. The balls were inscribed by the likes of William Howard Taft and Woodrow Wilson and had been donated to the museum in 1968 by the family of Hall of Fame pitcher Walter Johnson. But that cover-up strategy backfired on Hall officials when the institution fell victim to even greater losses in the 1980’s as a result of a large scale heist of documents and photographs from the National Baseball Library. Despite those considerable losses, however, the Hall continued its long-standing tradition of sweeping its dark secrets under the rug with the hopes that no one would ever dig deeper to uncover the scandal. The institution, now headed by Jane Forbes Clark, has thus established an internal culture of cover-ups in violation of its charter as a 501 (c) not-for-profit educational institution dedicated to preserving collections for “a global audience.” The Hall maintains a vast collection of donated materials valued at close to a billion dollars, so, some might say what’s been lost and stolen is a “mere bag o’shells,” to quote Ralph Kramden. But reminders of the 1980s heist keep resurfacing with great frequency thanks to outfits like Heritage Auction Galleries in Dallas, Texas. As one of the world’s largest auction houses Heritage says it has grossed over $918 million in sales just this year but in baseball circles they are known notoriously for the serial-selling of treasures stolen from the Baseball Hall of Fame. 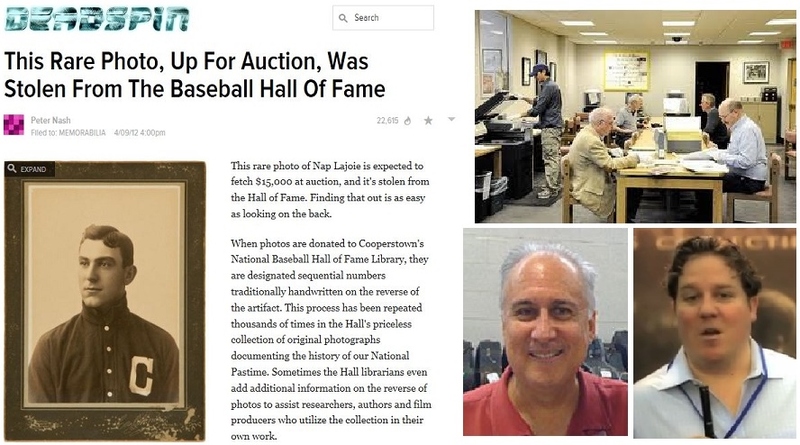 In addition, one of Heritage’s key sports auction consignment directors, Mike Gutierrez, is even more notorious as the prime suspect for thefts from the National Baseball Library dating back to the late 1980s. Is it just a wild coincidence that so many documents apparently pilfered from the Cooperstown archives are finding their way to Heritage? This 1911 protested game letter written by Honus Wagner appears in the current Heritage auction and is believed to have been stolen from the National Baseball Library. 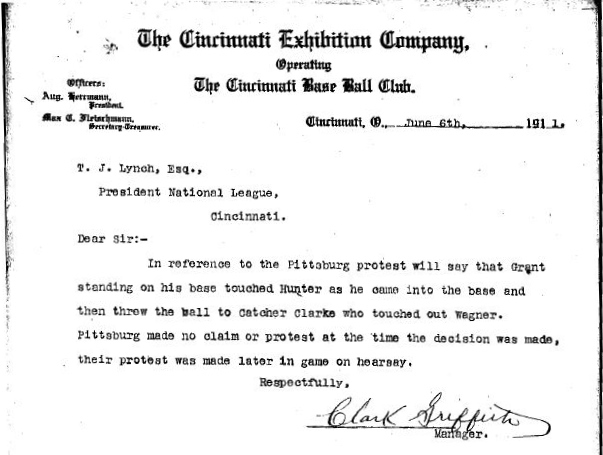 This letter was sent by Reds manager Clark Griffith to NL President Thomas Lynch regarding the same protested game that is also the subject of Heritage's Honus Wagner protest letter. While Wagner's letter is being sold by HA, his manager's letter regarding the same protested game remains in the HOF's August Herrmann Archive. While the protested game files include letters from team owners and managers like Fred Clarke, they also include the statements and testimony from the players involved in the actual disputed plays on the field. In Clarke’s letter he details the play and the players involved including Wagner, Bill McKechnie and Eddie Grant of the Reds. The Herrmann Protested Game files include the statements of Bill McKechnie and Eddie Grant. The Herrmann protested game file, of course, includes the statements of McKechnie and Grant while the statement of Honus Wagner is curiously absent. All of the letters in the possession of the National Baseball Library in regard to the Pittsburgh protest are found in “Box 44, Folder 24″ of the August Herrmann papers archive. 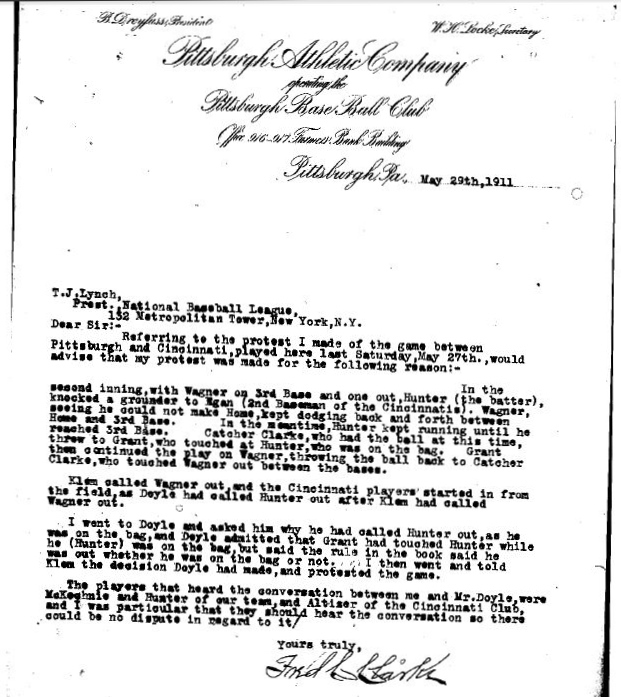 It appears that every other letter sent to President Lynch regarding that particular protested game is present in the file except for the statements of Honus Wagner and HOF umpire Bill Klem. The Klem letter surfaced and was offered on eBay in 2011 with no mention of its provenance. The National Baseball Library has created a finding aid for the the correspondence archive of August Herrmann (inset with Ban Johnson) which includes a box devoted to documents related to NL protested games. The Heritage Wagner letter was once found in "Folder 24" which is marked "Additional protested Games 1902-26." What’s even more curious is that Heritage and Chris Ivy won’t say where the Wagner document came from or reveal any information related to its provenance or the consignor. Adding to the likelihood that the Heritage offering originated in the Herrmann Papers files, the Hall’s protested game files still retain at least one other Wagner protest letter describing a Bill Klem call in June of 1909. So, how did the other Wagner letter from 1911 make its way to Dallas and into the current Heritage auction? 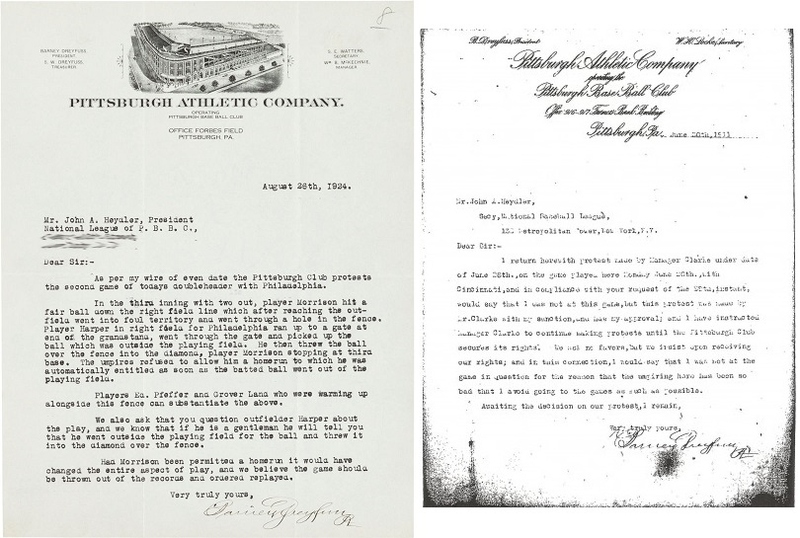 Bill Klem's letter to the NL President regarding the same game in 1911 was offered on eBay in 2011 (left). 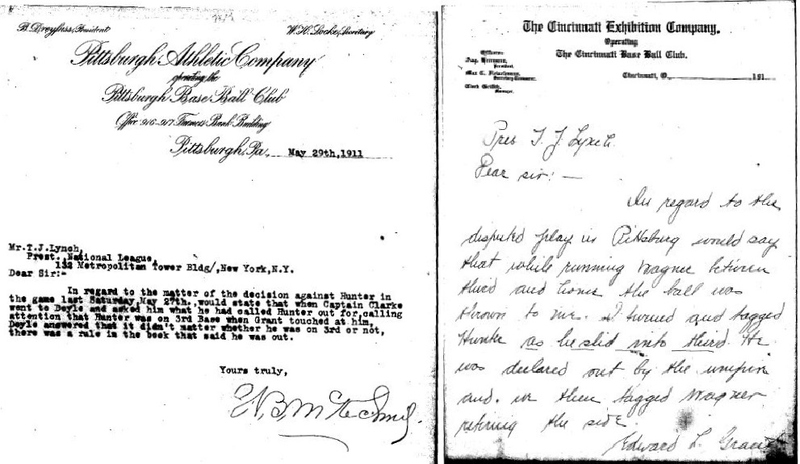 The HOF files include another Honus Wagner letter about a Klem call in a 1909 game (center). The Hall has other letters written by Fred Clarke & Barney Dreyfus although many have been removed from the files. The Wagner letter isn’t the only dubious protest letter in the current Heritage sale as Chris Ivy is also offering a 1924 Barney Dreyfus letter to NL President John Heydler protesting another Pirate game. In 2011 Heritage removed another Dreyfus letter sent to Heydler on August 26, 1924, regarding a protested game because it was believed to have been stolen from the Cooperstown files. The Dreyfus letter in the current Heritage sale was sent by Dreyfus on August 27, 1924. It appears that although Ivy removed the previous Dreyfus letter, the Hall of Fame’s failure to claim title has opened the door for him to actually sell the stolen protest documents. Heritage is also offering a protest letter sent to the NL President by Barney Dreyfus in 1924 (left). The HOF files retain several Dreyfus protest letters including one written in 1911(right, NBL). The Wagner and Dreyfus letters are the most recent in a long line of other alleged stolen documents offered by Heritage including examples written by Babe Ruth and the 1915 Red Sox team, Charles Comiskey, Fred Clarke, Joe Tinker, AL President Ban Johnson, and Ed Barrow. Two other rare documents originating from the Herrmann Papers and signed by Miller Huggins and Hank O’Day were recently consigned to Heritage by veteran autograph dealer Jack Smalling who claims the two letters were given to him in the 1960’s by Baseball Hall of Fame historian Lee Allen in consideration for work he’d assisted Allen with. While Lee Allen had no authority to give away the documents that had been donated to the Hall by Powel Crosley Jr. in 1961, the two documents that Jack Smalling says he was given are the only two letters that have surfaced with an actual provenance story from its owner. Most all of the other letters that have surfaced have changed hands several times and some have even been traced back to Heritage consignment director Mike Gutierrez. Mike Gutierrez of Heritage was the prime suspect in the 1980's HOF thefts; The Clark family, represented by Jane Clark (center) chose not to pursue prosecution or recovery; Bud Selig and MLB have done nothing to recover the missing NL documents. To the contrary, this writer would only advise Heritage to reject consignments of such material and to refrain from the sale of suspect or stolen items, even if the rightful owner fails to claim title. Ivy’s stance is also patently disingenuous as he surmises that the Hall’s failure to claim the letters as its own gives him the right to sell them and somehow makes the items legitimate. The evidence strongly suggests that Ivy is still selling stolen property owned by New York State. 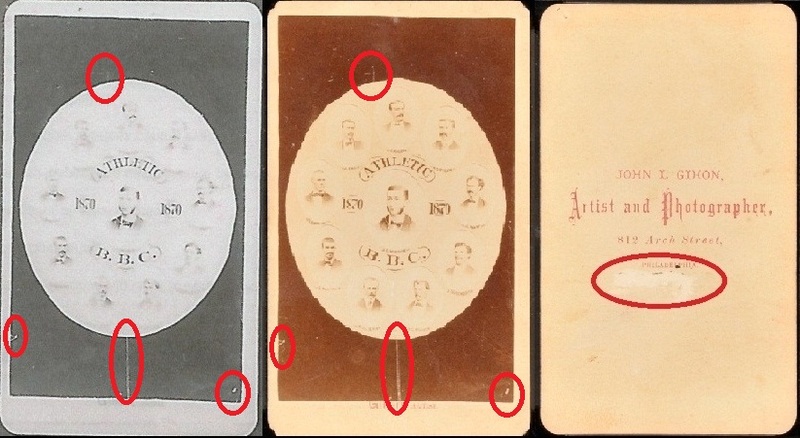 A rare 1870 CDV of the Philadelphia A's was photographed at the HOF in 1983 (left) and then appeared in a 2012 Legendary auction (center). The Hall of Fame failed to claim title to the stolen rarity despite the fact the photo appears on SABR contact sheets and shows evidence that the accession number was erased (right). Ivy and others in the hobby are well aware that the Hall of Fame’s negligence is so pronounced that they even failed to claim title to a rare CDV photograph of the 1870 Philadelphia Athletics team that appeared in a Legandary Auctions sale in 2012. That same rare photo, valued at $5,000-10,000. was actually photographed inside the Hall of Fame building in 1983 as part of a Society For American Baseball Research (SABR) photo shoot conducted by Mark Rucker and John Thorn, editors of a 19th century photographic publication. Thorn saved the actual contact sheets from the photo shoot and those sheets placed the Legendary auction lot at the Hall as New York State property. The rare photo pictured on the contact sheet and on the auction website both had a unique scratch on the albumen photo paper and the reverse of the auction lot had a damaged section where the Hall’s accession number was once written and has been defaced and removed. While the Hall of Fame has failed to address the theft issue publicly and have also failed to claim title and pursue recovery on numerous donated artifacts that have been stolen from the library, there have been some recoveries which further confirm the reality of the 1980s heist that yielded millions in material for the robber or robbers. Rare cabinet photographs of Hall of Fame pitchers Christy Mathewson and Mickey Welch were offered by Mastro and Robert Edward Auctions with tell-tale ownership marks on the backs of the cards which were recovered after we published articles on each offering. Another stolen photo was a rare $20,000 Horner cabinet of Napoleon Lajoie that was offered and withdrawn from a Heritage auction after we published an article at Deadspin. It’s not clear if that photo was returned to the Hall. In 2012, Heritage offered a Nap Lajoie cabinet photo stolen from the HOF and the story was reported at Deadspin (left). HA employee Mike Gutierrez has been accused of swiping documents and photos from the HOF library (top right) but his boss Chris Ivy (bottom right) still offers stolen and suspected stolen HOF property because the museum does not pursue recovery. Two years ago, ex-Hall library employee, Bill Deane, told Hauls of Shame he witnessed Gutierrez researching at the NBL on numerous occasions in the late 1980s and also said that Gutierrez was unsupervised with total access to the library collections. Deane said the library had no security and also confirmed that Gutierrez was the “prime suspect” in the Hall of Fame heist when Hall officials decided not to pursue prosecution because of fears of negative press and a backlash from past and future donors. Deane also confirmed that Gutierrez was barred from entry to the Hall after the Ruth incident and added, “They said he wasn’t allowed here, he was blacklisted from the National Baseball Library.” Another ex-Hall official confirmed Gutierrez’ ban from the library and also said that a list of banned library thieves was passed along to Jim Gates when he assumed the position as the Hall’s head librarian. Hauls of Shame contacted the Hall of Fame’s President, Jeff Idelson, and his Director of Communications, Brad Horn, for comment but neither responded to our inquiry. Jane Forbes Clark did not return calls made to her Clark Estates office in Rockefeller Center in New York City and the Wagner letter has been reported to the local Cooperstown Police Department that has filed official reports previously on other items offered by Heritage. Cooperstown Police Chief Mike Covert was unavailable for comment. With all of the circumstantial evidence stacked against Gutierrez, his boss, Chris Ivy, still offers no answers related to the provenance of any of the suspect items in his sales like the Wagner and Dreyfus protest letters. 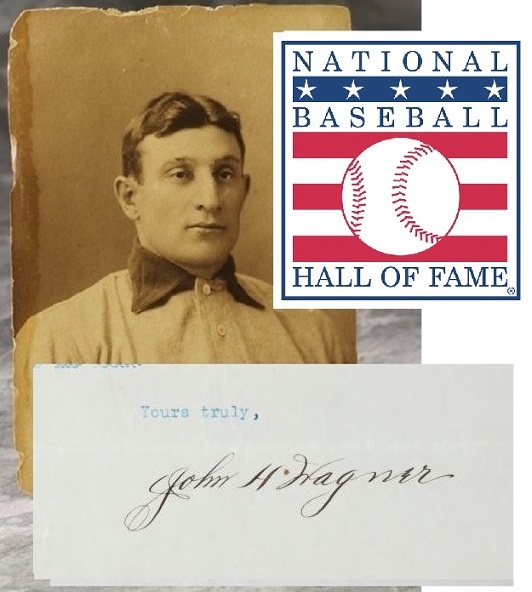 He offers no explanation as to why the Hall of Fame’s Herrmann protest file has virtually every other letter and statement related to that game against the Reds and Pirates in 1911 except for lot 81674, the Honus Wagner letter. According to Ivy, a signed statement from the owner of that item simply stating he has clear title to the stolen letter is all that he and his father Steve Ivy require. Heritage is no stranger to getting caught selling stolen materials ranging from a Green Jacket from the Masters to an actual Tyrannosaurus Bataan dinosaur skeleton. As evidenced in our last report, Ivy and Heritage also have no problem offering fake and fraudulent items like the 1912 John Ward letter that is still currently for sale despite being identified as non-genuine in a hobby reference guide written by Ron Keurajian. When offering fakes, Ivy and Heritage simply stand behind the fraudulent LOA’s issued by JSA and PSA/DNA, the authentication companies infamous for certifying forgeries like Heritage’s $149,000 1927 Yankees signed ball signed in green ink and a 1939 Lou Gehrig single signed baseball advertised as one of the last he ever signed. As for the genuine but stolen Honus Wagner letter, the bid currently stands at $1,400. Where it ends up only Chris Ivy and the winning bidder will know. A return to Cooperstown seems unlikely. I’m sure there must have been a Barney Dreyfus letter in the file for that game too. Wonder when Heritage will auction that one off? Why are all of these letters showing up at Heritage? Ask the expert from the Antiques Roadshow. The Wagner letter now has a bid of $1,500. Stolen Wagner letter up to $2,400 on auction night, Dreyfus up to $3,400. The more I read about this, the LESS I blame the auction houses. If the Hall of Fame couldn’t care less about this stolen material, why should the auction houses? It’s been said the Barry Bonds isn’t worthy of the Hall of Fame. Maybe it’s the other way around.